3 bedroom 2 bath luxury rental villa for up to 6 persons with huge private pool on the water. Situated at the Sea Forest in New Port Richey Florida this short term vacation villa is a great place to stay on the Gulf of Mexico. 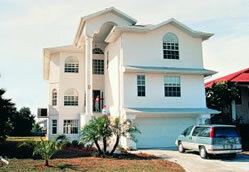 This three bedroomed, two bathroomed beautiful vacation home located in Sea Forest on the Intercoastal Canals. Located on Blue Fish Bayou watch the dolphins play and the fish jump. The villa sleeps 6 people in comfort with family room and formal dinning area. This three storey home over looks Blue Fish bayou. First floor living accomodation. Tv in family room, master bed room and second double room. . Formal dinning area and eat in kitchen. Large kitchen, fully equiped should you decide to eat in. Table tennis table in basement.Lots of room to spread out and relax. Fish from your private dock or just lie in the sun. • Es wird eine Kaution ($300) mit der letzten Zahlung erwartet.